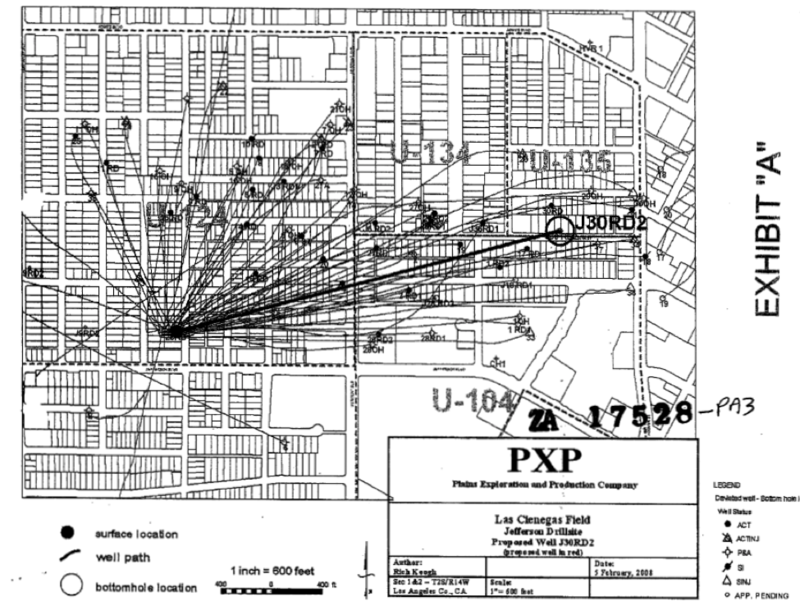 Pipelines emanating from the drill site at Jefferson/Budlong run under many homes in the neighborhood. Spring is the season for oiling, it seems. 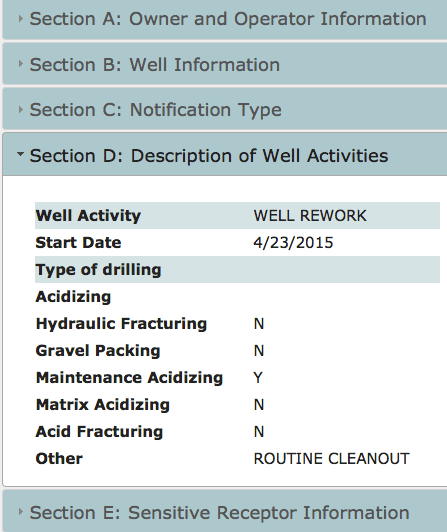 Over the last month, I’ve been opening my email every morning to see anywhere between 10 and 20 notices from the South Coast Air Quality Management District (SCAQMD) advising me that wells across the county will be drilled, reworked, subjected to routine maintenance, or completed at some point within 24 hours to 10 days. The notifications come as a result of Rule 1148.2 (d), which requires operators to notify the SCAQMD — who then notifies the public — of planned operations with information about the well, a description of the planned activities, and information about the nearest sensitive air quality receptor. But that is not particularly reassuring to neighbors in West Adams, some of whom turned out to protest the well maintenance activities Freeport-McMoRan (FMOG) had scheduled for a well in the heart of a residential neighborhood at Jefferson and Budlong (above) yesterday. The notification residents receive about the operations planned for the well next door are rather unspecific. Find the original notice here. Just a day and a half earlier, they had received notice that a well would be reworked via “maintenance acidizing” and, angered by the potential of having an unspecified amount of toxic chemicals trucked through their neighborhood streets and injected into the ground beneath their homes, they planned to meet the trucks at the site. The confrontation never happened — at 6:44 yesterday morning, FMOG filed a cancellation notice. The neighbors still held their protest, documented here by the L.A. Times, complaining about odors and noise at the Budlong site and decrying the city’s failure to move forward on the regulation of drilling in residential areas. Although FMOG has reassured the city and the neighbors that their operations are safe — even going so far, at one point, to request that the Zoning Administration absolve them of having to have their applications to drill new wells subjected to public hearings — the general lack of transparency surrounding their operations at the residential sites has not helped their case. And the full extent to which these activities may or may not be harming the environment is still under investigation. Because well-stimulation operations — including fracking and acidization — are not considered to involve major alterations to land, tend to occur at long-standing oil drilling facilities, and are considered to have no significant impact on the environment, as long as projects comply with all applicable laws and regulations, they have not previously been subject to CEQA. The signing of SB-4 into law in 2013 required the Division of Oil, Gas, and Geothermal Resources of the Department of Conservation (DOGGR) — the regulatory agency overseeing drilling in California — to both define a range of unconventional drilling practices, adopt rules and regulations specific to those practices, and develop a comprehensive Environmental Impact Report (EIR) pursuant to the California Environmental Quality Act (CEQA). But even as DOGGR works to finalize an (EIR) that will identify the potential impacts of a project and any feasible mitigation measures, and the state conducts a companion scientific study to explore the extent to which operations might result in groundwater and surface water contamination, greater greenhouse gas emissions, local air pollution, greater seismic activity, harm to wildlife, native plants and/or habitat (among other things), that information may be coming in too late to be effective. Both of the final impact studies are due July 1, 2015, but the draft regulations governing enhanced drilling operations were already submitted on January 1 of this year and will go into full effect just as those studies are being turned in. It doesn’t mean that findings from those studies can’t be incorporated into the final regulations, but it does mean that the likelihood of there being sufficient time for a healthy public debate around any findings and the extent to which they would be addressed by the regulations is quite small. And, because the EIR only covers well stimulation treatments and not “steam flooding, water flooding, or cyclic steaming and [does] not include routine well cleanout work, routine well maintenance, routine removal of formation damage due to drilling, bottom hole pressure surveys, or routine activities that do not affect the integrity of the well or the formation,” we may not get a full accounting of how well maintenance activities might affect surrounding communities like those near the Budlong site. Leaving neighbors, as they have for years now, to continue to search for answers on their own. If you’d like to read the draft EIR produced by DOGGR, please click here. If you just want the Executive Summary, that can be found here. If you’d like to learn more (and see Volume 1) about the study commissioned by the California Natural Resources Agency (and conducted by the California Council on Science and Technology (CCST)) regarding a scientific assessment of well stimulation treatments, including hydraulic fracturing, please click here. The SCAQMD Hearing Board Will Receive Public Testimony on the Exide Battery Recycling Plant on December 14th. That Means You.